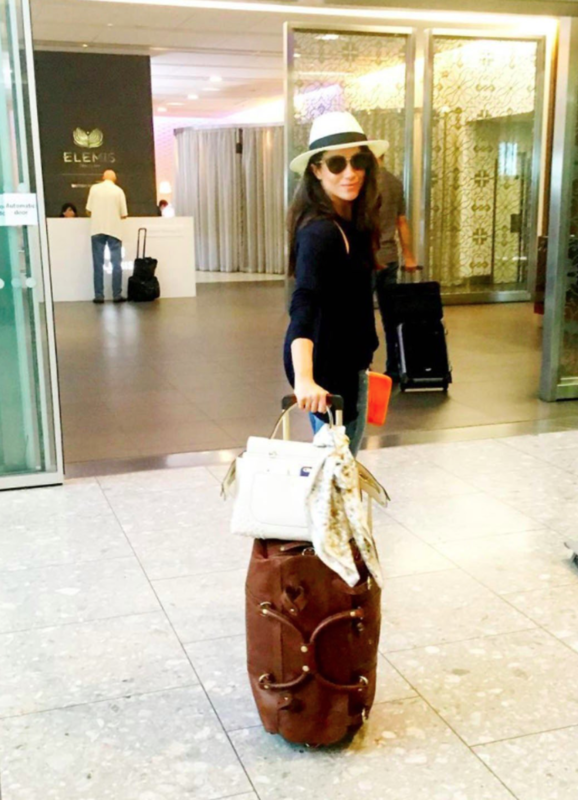 What’s the product that Meghan Markle calls a ‘travel essential’ and has been spotted travelling with it regularly over the past year? This chic orange tech case! The Stow First Class Leather Tech Case keeps travel essentials zipped and secured in a large, hand made, super-soft Spanish leather wallet. 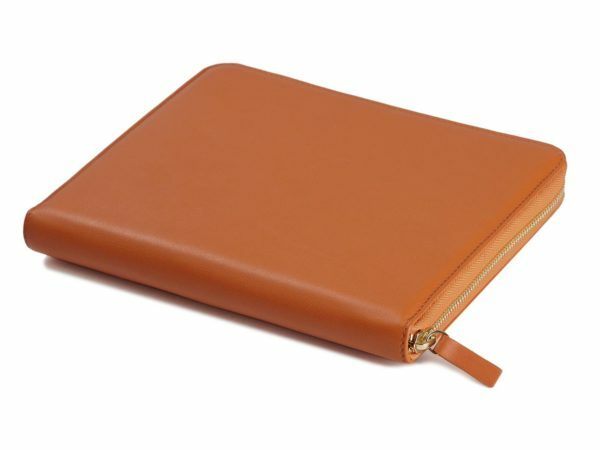 With a shape inspired by traditional leather writing cases, it’s today’s traveller’s must-have accessory for on the go communications. The orange case was first seen on Meghan in January 2017, although it had been featured previously on her Instagram account. It has since been seen numerous times, including in Austin and Toronto. 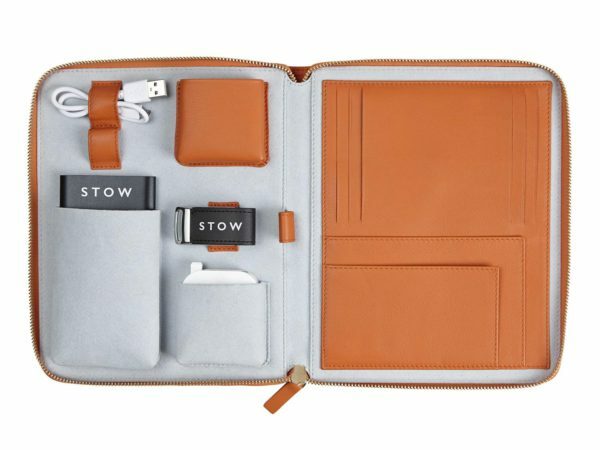 The tech case combines leather wallet, powerbank charger and cable, an award winning international foldaway plug set and a powerful memory stick. Also available is an optional mini adaptor pack. Travel ID and documents can be neatly arranged within the right-hand side of the case. The genius MU USB power block can be interchanged with international plug adaptors for the EU, UK, USA and Canada, ensuring that you tech is always charged no matter where you are in the world. Also available is an optional mini adapter pack. Travel ID and documents can be neatly arranged within the right-hand side of the case. The wallet ensures your tech is always charged no matter where you are in the world. The Stow First Class Leather Tech Case is still available. It comes in several colour combinations other than the Amber Orange and Pale Blue favoured by Meghan – Obsidian Black and Power Blue, Sapphire Blue and Grey, and Sovereign Gold and Pink. If the £400 price tag isn’t in your budget, there are a number of alternatives. From boldly coloured but simple, to multiple compartments, to a classic design, check out some tech cases for your next trip for a travel style like Meghan Markle! Meghan is definitely one of the brand’s favourite clients… She’s prominently featured on their homepage as a “friend of Stow”, who share that she’s had the case for about 18 months, around the time we started to see it pop up on her Instagram account. It’s definitely become a popular item for fans of Meghan’s style.